You were just hit by a bus, now what? What is your bus coefficient? Meaning, if you were to suddenly be removed from your role what would happen. Imagine that metaphorically you were just hit by a bus. What will happen to your projects? What will happen with your team? Of course, I hope you weren’t really hit by a bus. The point is that everyone needs to have a succession plan. As part of your career planning efforts at least 20% of your time should be committed to think about what’s next and how you will react if an unexpected event occurs. Imagine you were just promoted or allowed to hire new staff member for your team. Of course, these are the things you can think of after you finish doing you happy dance. These are things leaders need to consider. As a leader you are expected to have a succession plan in place. You should also consider having a disaster recovery plan in your back pocket. Not that you expect or want to have the worst happen, but things have a way of happening when you least expect it. It’s better to have thought through a list of possibilities and be ready to take action. What if it’s not you, but someone on your team? Imagine your best team member gets poached by the competition. Consider the possibility of your colleague being promoted to be your manager. Think about what would happen if your manager decides to move on. Even if you aren’t the manager of a group today you may want to think about the business holistically and be ready to make a suggestion and take action when the unexpected promotion, poaching of your best co-worker or even if that errant bus comes along. Do you have an OFTP? The points mentioned above can be used as a best practice. Another best practice I learned from a Gulf War Veteran is the OFTP. The One Folder Transition Plan which I wrote about in The Fastest Way to Get Promoted as a way to get people thinking about success planning. How will you handle a transition? 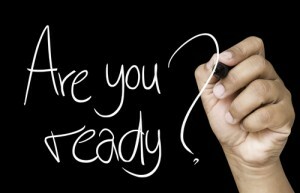 Will you be ready when an opportunity arises? Have you taken the time to consider the possibilities yet? Hopefully you were not actually hit by a bus. However, I suggest you imagine a scenario where both good and bad scenarios occur. Having a plan means you have thought through a few possibilities. This is something that can help you Stand Out in Your Career and can make you imminently promotable. Take some time today to imagine what would happen and how you would react in any of these situations. Take a few minutes to write it down and from time to time, perhaps quarterly, review your thoughts. Revise as necessary and make this part of your career planning efforts.